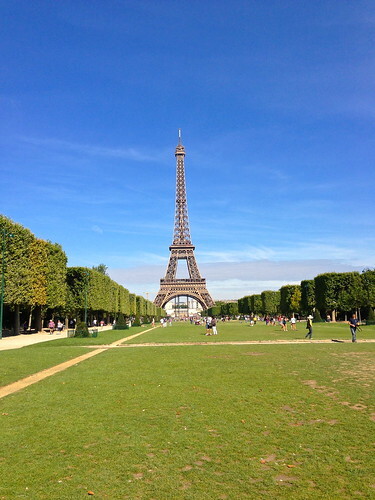 I’m totally skipping over Italy and Greece because I just have to write about Paris and all its amazingness right now! Don’t worry, I’ll get to all the delicious food, sites, beaches, and wine of Italy and Greece soon. 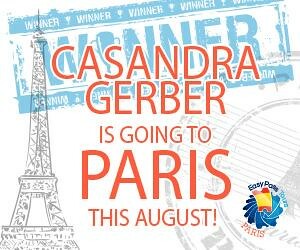 So, remember back in July when I won a trip to Paris!?! And then I closed the email and moved on to the next email because this obviously had to be spam. Then I suddenly remembered the company name, Easy Pass Paris, I had been FB liking all their beautiful Paris pictures over the last few weeks in hopes of winning a bike tour or front of the line pass. I also knew they were giving one person a trip to Paris. No way I actually won that! But I opened and read the email again. This time sitting up straight in bed next to my still sleeping husband. Then I looked around the room and kinda shook my head to make sure I was actually awake. I was. Now what do I do? I went to their Facebook page and found that image above with all these likes and comments about how lucky this Casandra girl is. Wait…that’s me! Then I gently woke up Greg and said guess what? Eyes still closed he said with a yawn, “what?” And then I giggled the words, “I think I won us a trip to fricken Paris!! !” He opened one eye to see if I was serious, and that’s when he noticed I was all giggly and in shock and he sat up (quickest I have ever seen him wake up BTW). Then I showed him all the evidence and we both sat in bed laughing for about an hour. Why we were laughing? I have no clue! Excitement. Disbelief. The insaneness that is WINNING A TRIP TO PARIS!! Well ladies and gentleman, it was very much real life and Greg and I were going to Paris! We already knew we wanted to go to Paris, but now it was basically going to be for FREE!! 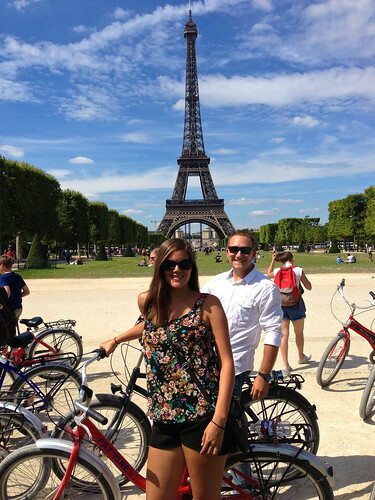 And we would get to see all of the main highlights of Paris and skip the dreaded lines! The lines that wind around the Eiffel Tower and the Lourve for hours on end. We wouldn’t be the poor souls getting sunburned. We wouldn’t have to wait behind a crying child. We wouldn’t have to not drink water in fear that we would have to leave the line to find a far off bathroom. 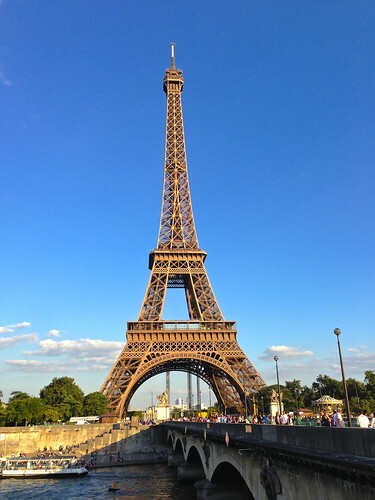 Our hotel was in walking distance of the Eiffel Tower so as you can imagine we went and visited her on a daily and nightly basis. We enjoyed sunsets with a baguette and champagne with her. We watched her twinkle every hour after sunset. We rode our Fat Tire bikes around her. 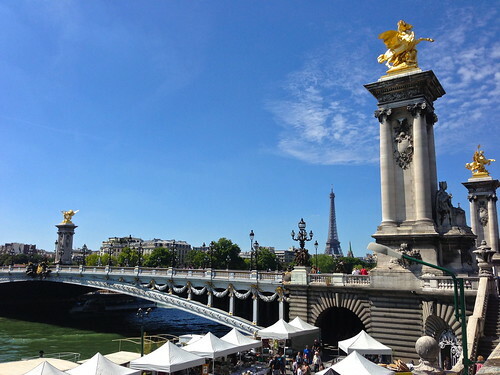 We waved to her from afar at our favorite bridge, Pont Alexandre III. We cruised by her along The Seine River. 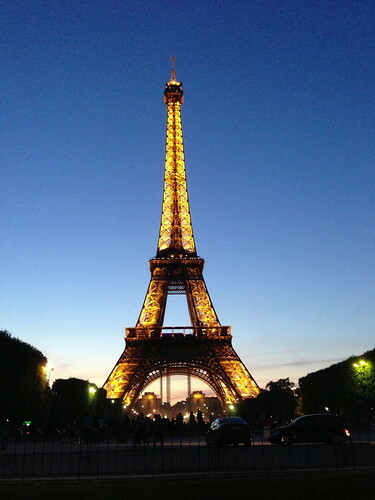 Paris was magical, and as you can probably guess, The Eiffel Tower was my favorite. I have so much more to share from our trip, so be sure to come back for Part 2. 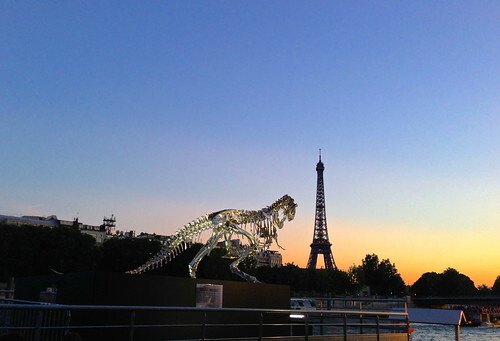 Biking around Paris, sunset behind the Lourve, a Mona Lisa sighting, more Eiffel Tower goodness (this time from the top), Moulin Rouge, a surprise visit from one of my besties, and we skip the longest line in the history of the world. Well, I imagine it was the longest line ever because there is no way a line could be any longer than the one at Versailles. Thanks so much to the amazing people at Easy Pass Paris and Fat Tire Bikes for showing us around their beautiful city and treating us like royalty in Paris. I definitely felt like Kate and William….or Kim and Kanye our whole trip. You are seriously the luckiest person in the world!! So glad you had fun! Where are you off to next?? Only the best for our kids!! Casi you have the gift (besides Greg!) lol!! We’re off to Switzerland on Monday! Can’t wait to see those Alps! Amazing, amazing, AHHHMAAAAAZING!! I LOVE reading about all your adventures and the photos are spectacular! Oh, Paris!! I hated it when we first arrived, but by the end of our short visit, I really didn’t want to leave. Paris was magical. I want to go back!